Air conditioning is essential to the modern work environment.The two aspects of cooling in the office are a comfortable environment for staff and maintaining equipment.There are factories and offices that run mostly without air conditioning. They are however at risk of losing productivity and potential equipment failure. Air conditioning maintains a comfortable working environment for staff. A comfortable working environment also means higher productivity. During hotter months, in non-air-conditioned environments, worker productivity suffers. In addition to that, depending on the work environment, there is the danger of heat exhaustion and other health issues. Research has found that the effect of wear and tear on equipment is negligible when it is run within the recommended operating temperatures. Run any equipment like servers outside of the recommended temperature range and risk reducing the lifetime of your office equipment significantly. This is why air conditioning is essential in the modern work place. Some older workplaces don’t run air conditioning because high installation costs or difficulties to install plants and outdoor units. However, there is an alternative. Portable air conditioning can get cooling to the right areas with limited installation costs. Proper environmental and computer cooling will ensure that you have a productive workforce and that you also get the most out of any equipment. 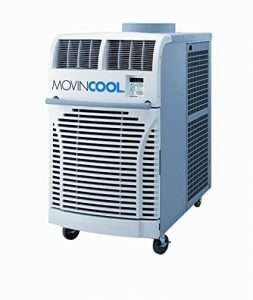 MovinCool carries a range of Ceiling mounted portable air conditioners that are a great alternative for fan coils and fan coil units.